Here’s the other side of 342 Water Street, which started life as the Burns Building, designed by William Blackmore for John Burns, with an additional two storeys added in 1911 by Grant & Henderson. In 1901 Turner Beeton & Co occupied the building, the company founded by John Turner who was at different times Mayor of Victoria and Premier of British Columbia. Also occupying the building were S Greenshields & Co, founded in Montreal by a Scottish businessman, Samuel Greenshields, and expanded across the country to be the largest suppliers of dry goods, including cottons, woollens, carpets, household furnishings, dress goods, and notions such as gloves, hosiery, and laces. In 1910, before the extra floors were added, Greggs, importers of Japanese Goods were here with the Canadian Rubber Co of Montreal. Ten years later the Dunlop Tire Co had half the building and the Western Dry Goods Co of Canada, Ltd the other half. Despite the ambitious title, they appear to only have operated in Vancouver, run by R B Mackedie and E St John Howley. In 1930 Dunlop were still in the building, but the other half was J H Hunter & Co, another dry goods company headed by T E Leigh. Buscombe & Co were run by George Buscombe, and they were in a smaller building next door to the east. 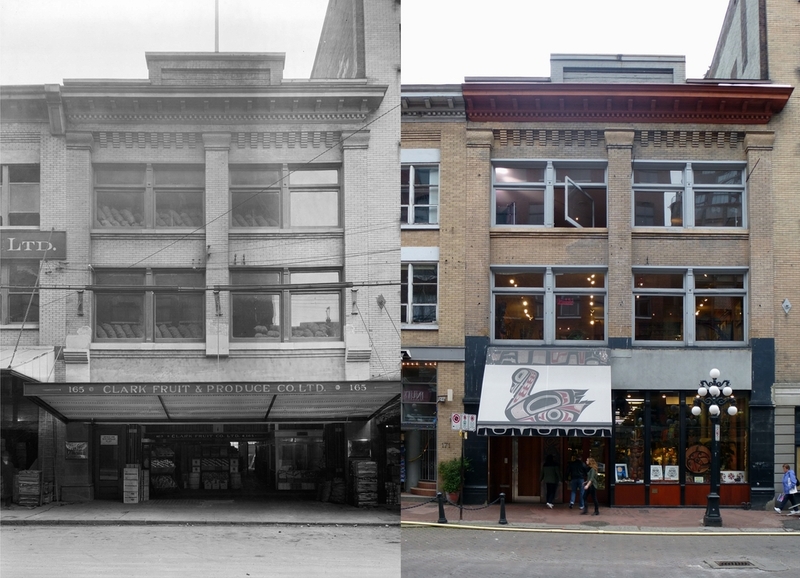 In 1935 they were shown at 341 Water Street, and a year later at 342 – this building. (The 1935 entry might be an error, although it’s repeated in the directory). The company had been founded in 1899 when Fred Buscombe bought out James A Skinner and Co, china and glass importers, originally founded in Hamilton. He was at different times President of the city’s Board of Trade, and Mayor of Vancouver in 1905. He was also president of the Pacific Coast Lumber & Sawmills Company, and director of the Pacific Marine Insurance Company. By the time the company moved to this building there were several Buscombe family members associated with it, including George, Fred’s brother, but Fred had retired. He died in the same year that the picture of the building was taken; 1938. The other company in the building were the Julius Shore Mail Order House. Dealing mostly in furniture, Julius Shore was a prominent member of the city’s Jewish community. 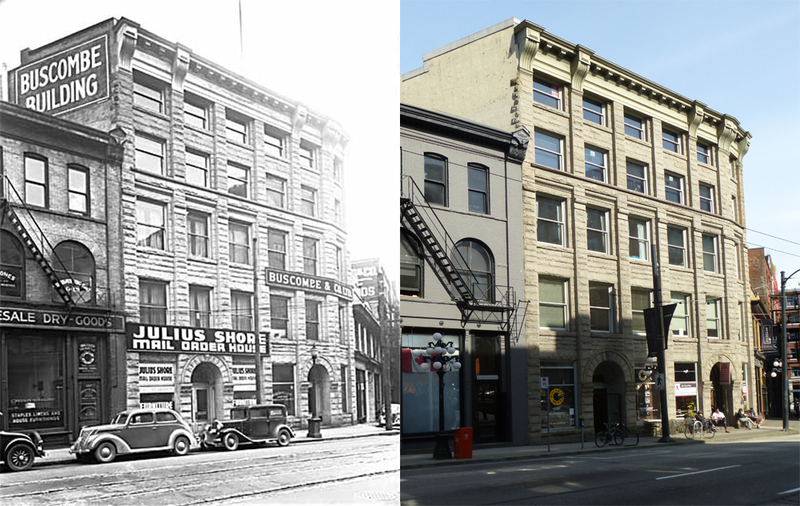 His father, Benjamin, was manager of a coal company in the late 1920s while Julius was at UBC, and in 1935 Julius was working with Dominion Furniture and seems to have established his company soon after, moving into Water Street at around the same time as Buscombes. The most recent restoration of the building took place in 1997, designed by Rafii Architects, and today it’s home to Brioche Urban Eatery. Upstairs are a range of office occupants, from a Massage school to a coal company and the Union of British Columbia Indian Chiefs. This building was built in 1899 as The Burns Block, but became known later as the Buscombe Building. It has two similar facades – one to Water Street, and one on West Cordova. It was designed in the same year, and by the same architect as the Flack Block; William Blackmore was hired by John Burns to build a three storey stone building. It appears to be one of the last buildings Blackmore designed on his own – a year later his son Ted (E E Blackmore) was in partnership. The other John Burns also lived on Barclay Street, and there’s one connection that might make him more likely to be the developer of this warehouse. He was the father of Fred Burns of Boyd, Burns & Co, (who developed a warehouse on Columbia Street), and he had a Queen Anne style house built in 1900 designed by William Blackmore. It’s that fact that leads us to think he was the developer of the warehouse. He was a Scottish-born widower, and the 1901 Census said he had arrived in Canada in 1896, although only Fred is listed in the directory in 1896 and 1897. In 1899 when the building was commissioned he was aged 67 and was described as retired, with the phone number 100. In 1868 he had been living in Bridgeton, Lanarkshire when his wife Jane gave birth to their son, Frederick Fowle Burns; (Jane’s maiden name was Fowle). Twenty years later, in 1891 they were living in Eastwood, Renfrewshire. In 1911 the Fred Burns family were still listed in the street directory, although they’re not obvious in the Census. Whichever John Burns owned the building hired Grant and Henderson that year to add two additional floors at a cost of $13,500, which was executed in a grey Gulf Island stone matching the earlier phase of the building. Our image shows the building when it was occupied by Buscombe & Co in 1938. This is our second look at 68 Water Street – and really it’s 68 and 76 (but now combined to be a single parcel, and so one address). We’ve seen the building that stood here until 1911 – the Gold House hotel, and also the first four-storey building erected by Edward Lipsett to the east, initially in 1906. That was built with a heavy wooden frame and brick infill. There’s a second half of the warehouse in this picture (on the right), that looks at first glance like a repeat of the first building. We noted that there was a single storey building that initially replaced the Gold House hotel which can be seen on the edge of the picture of the 1906 building. The Gold House was still standing until 1911, and we think the single storey building was first built on the site, and then this building replaced it or was added later. That would be after 1920, assuming the May 5th 1920 date is correct in the previous VPL image. It’s construction is quite different – poured in place concrete, although the façade is a match to the original (although the window pillars don’t have to be as thick, as the beam above takes the weight). We thought Dalton and Eveleigh also designed this – they were still designing buildings up to 1920, although there wasn’t much work around. It now looks as if it’s quite a bit more recent: thanks to Patrick Gunn’s digging in the building permits we know P P Brown (probably structural engineer Philip Brown) designed a $25,000 Factory/Warehouse for E Lipsett, built by Baynes and Horie, in 1927. This 1940 VPL image shows Edward Lipsett’s company was still the occupant. Edward Lipsett was still president of the company, which has expanded to include all sorts of ships chandlery and marine supplies. Ten years later the company was still here, and Mary Lipsett was president, although she had announced her intention to retire to California in 1949. Edward Lipsett had died, aged 80, in 1948, but there was another Edward Lipsett who was vice-president, living in West Vancouver. Mary Lipsett started collecting native artifacts in 1900, focusing on the northwest coast. A couple of decades later, she got into Oriental art. Her collections eventually ended up at the Museum of Vancouver after having been exhibited in a former aquarium on the PNE Grounds from 1941, moving to the BC Pavilion on the PNE grounds in 1954. When the new Museum of Vancouver was built the Lipsett Collection was moved too, and is now an important part of the museum’s collection, including 1,075 items in the North American Ethnology and Archeology collections (650 of which are related to the northwest coast). Mary Lipsett died in 1952, at the age of 85. Here’s another warehouse on the city’s first street – Water Street. This was probably the third building to be built on this site in 1906, a warehouse and factory for Edward Lipsett, sail maker, costing $10,000 and designed by Dalton and Eveleigh. Before it was built there was a smaller wooden building, completed soon after the fire and before the fire it was also a developed site. After 1906 there’s some confusion about what was added when. There’s a $20,000 permit in 1912 for a 2-storey brick addition at the same address, built and designed by Baynes and Horie for Edward Lipsett. The Statement of Significance for the heritage building suggests that’s another building alongside is the 1912 development, but we’re not completely sure that’s correct. This building’s construction was heavy timbers with brick infill, as was the case with all the warehouses on Water Street at this time. The Vancouver Public Library image details for this photograph say it was photographed in 1920, but that would be inaccurate if the new 4-storey addition was built alongside in 1912. There’s another permit for 176 Water Street for Mr Lipsett in 1918 for a single storey building, also designed by Dalton & Eveleigh. If the accurate address was 76 Water Street, then that would be the building just showing to the right of the four storey building. It appears to have the name ‘Edward’ on the window – so it could well be Mr Lipsett’s extended premises. That would imply the additional 4-storey building standing today to the west would have been built some time after 1920, and not in 1912, and the VPL date is correct. It would also mean this building was built in stages: the main floor first in 1906 (with the Gold House next door), then the upper floors in 1912. 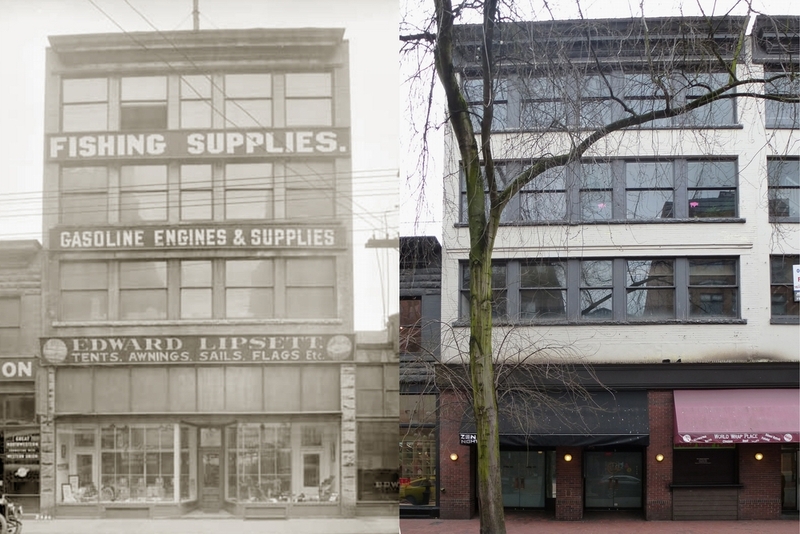 In 1891, Edward Lipsett started a small sail making business at 69 Water Street (across the street from here) and gradually included fishing, boating and hunting supplies before finally becoming a large retailer of industrial supplies, marine hardware, sporting goods and boats. Edward was born in the US – his family had Irish ancestry, and he was born in Cambridge, Massachusetts. His wife, Mary, is less clear – one census has her from the US, of Scottish ancestry, and another apparently from Nova Scotia of English origin. They arrived in Canada in 1890 from Boston and became Canadian citizens in 1898. In 1901 they were aged 34, and had three children, Roy, Harry and Evelyn, aged from nine to five. 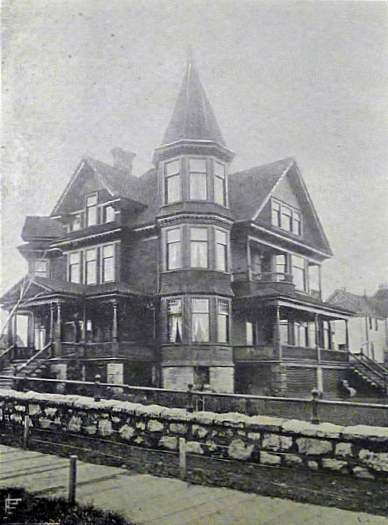 The family were still together in 1911, living at the house Edward had built at 1166 West Pender Street. Roy was a salesman, and his father (who in 1891 was recorded as a sail maker) is now shown as a marine goods supplier. In 1914 the company were described as manufacturers of canvas goods – sails, tents, tarpaulins, aprons, coats and overalls. Today the building has office space upstairs and a nightclub with an entrance on Water Street. Louis Gold re-built his hotel very soon after the fire destroyed the newly named Vancouver in 1886. He is unlikely to have hired an architect – it was a simple but surprisingly large property. Louis was one of the earliest residents, having been in Granville since 1872. His wife (who was German) and son, Edward, joined him a year later, and Gold ran a store mostly supplying visiting ships and loggers and the local native population (which was pretty much the entire population of the area at the time). His son recalled he had arrived via Victoria from San Francisco. Previously he was in Kentucky (where his son was born), and Louis had been born in Poland. He was the first Jewish resident in the area, and initially leased a store from Jack Deighton, later paying $550 to buy three lots from the Clarkson estate. An invoice from 1877 describes Louis Gold as an ‘importer of, and Dealer in, Groceries and Provisions, Clothing, Boots and Shoes, Caps and Hats’. He dealt in ‘Crockery, Cutlery, Kerosene Oil, Lamps, Fancy Goods, Laces, Embroideries, Kid Gloves and a General assortment of Merchandise’. Various city pioneers recalled different aspects of Louis Gold’s history to Major Matthews. He pre-empted land near the North Arm Road, and had several cottages that he leased out on Water Street, as well as his store. Gold’s wife, Emma, apparently had a life independent of her husband and ran both a grocery and shoe store – The Royal City Boot and Shoe Store – in New Westminster in the early 1880s. 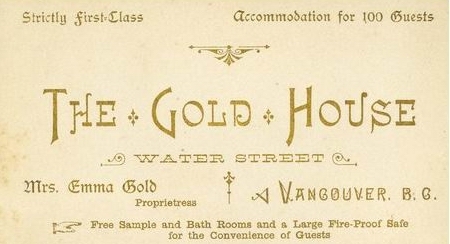 After the fire Gold switched from selling groceries and general merchandise to building the 100 room hotel, The Gold House. A 1940 newspaper report explained his method of dealing with difficult patrons. Gold was a short man, but he reportedly earned the nickname “Leaping” Louis by springing into the air in the course of some fracas, “swinging his fist mightily and landing with his full weight on his opponent’s chin. This seldom failed to yield a knockout”. Louis backed Malcolm McLean as the new city’s first mayor, and it was the Gold’s carriage that was used to celebrate the disputed win. A few weeks later, when the fire started Louis is said to have escaped by jumping into Burrard Inlet (across the street from his store). In 1888 the provincial Government considered a request to purchase the pre-empted land. Louis was in England – in Liverpool – at the time, but his lawyers and son received a favourable response to their land claim. Exactly what Louis was up to in England has never been established, but a Mrs Agnes Brown contacted Major Matthews to insist that one thing he had done was marry her (bigamously) and father four children. As he was illiterate, she had written letters to his wife for him (believing she was writing to his mother). The Gold House appears in street directories until 1911, although Louis died in 1907. Emma, his wife, was running the Gold House in 1888, then appears to have moved, reappearing in Vancouver from 1892, recorded somewhat prematurely for many years as his widow. Louis wasn’t associated with the hotel that bore his name after 1888 (and doesn’t seem to be in Vancouver in the 1890s or early 1900s, although there are several men in England with the same name during this period) which might support Mrs Brown’s claims. Mrs Anderson had the hotel in 1889, Roland Lambert and Nathaniel Darling were proprietors in 1890, when the Vancouver Public Library picture was taken. Colin Dawson was running it in 1892, W Holmes in 1896, Frederick Clem ran it for several years in the early 1900s and J B Dorfman in 1905. In 1910 it was H M Marriott in charge, as he was a year later – the last time the Gold House was listed. The 1892 Street Directory lists everybody living in the hotel – nearly a third of the rooms were occupied by permanent guests (some associated with the establishment, like Colin Dawson, but others with jobs in the city like Moses Cole, a CPR brakeman and Lewis Hollingsworth, a barber. In 1912 Edward Lipsett, a sailmaker and canvas merchant added a second warehouse next to his 1906 building on the site of the Gold House, designed by Dalton and Eveleigh. Emma Gold died in 1927, and was buried in Mountain View cemetery with her husband. More of Water Street’s commercial buildings survive relatively unchanged than most other streets in the city. This is the Pither and Leiser warehouse, built in 1905 and completed in 1906 by E Cook for a Victoria-based import company. It cost $10,000 to build, and was described as “three full storeys, deep basement; large plate glass front windows and wide entrance; Fensom electric freight elevator; first storey bonded warehouse, top storey for sundry duty-paid goods”. There were three Leiser brothers in Victoria: like the Oppenheimers in Vancouver they were born in Germany (in Kerpen near Cologne) into a Jewish family, and like the Oppeheimers they succeeded in trade, operating grocery import companies and making their fortune supplying the gold miners, initially in the Cassiar, in Yale, and later the Klondike. All three were Freemasons, as well. One of the brothers, Simon, had the largest wholesale grocery in British Columbia in 1890, and his daughter married an Oppenheimer in Vancouver. Another brother, Gustav, was a partner in the wholesale dry goods firm of Lenz and Leiser in Victoria. The third, Max Leiser imported and wholesaled wine and liquor, and also cigars. The company warehouse in Victoria was on Wharf Street and Max later developed other property in Victoria including the Kaiserhof Hotel on Blanchard Street designed by Thomas Hooper. Pither and Leiser’s business dated back to 1858, when an alcohol and cigar import firm was established by A Casamayou. By 1888 it was known as Boucherat & Co, owned by John Coigdarripe (a Frenchman) and Luke Pither (from New York). Max Leiser bought his partnership in 1893, when the name was changed. They were importers of Mumm champagne, Gordon’s gin and Johnnie Walker and Whyte & McKay whiskies. In 1912 George Joy was manager of the Vancouver branch, originally designed in 1905 by Hooper and Watkins. (The company had initially set up shop in the city in 1900). However, if the directories are to believed the business had just moved next door, to the west, into a newly completed building. Oscar Brown, a fruit wholesaler moved into this building and made some changes. It looks as if the design used the centre pivoted windows generally associated with Parr and Fee buildings, so they might be the designers. 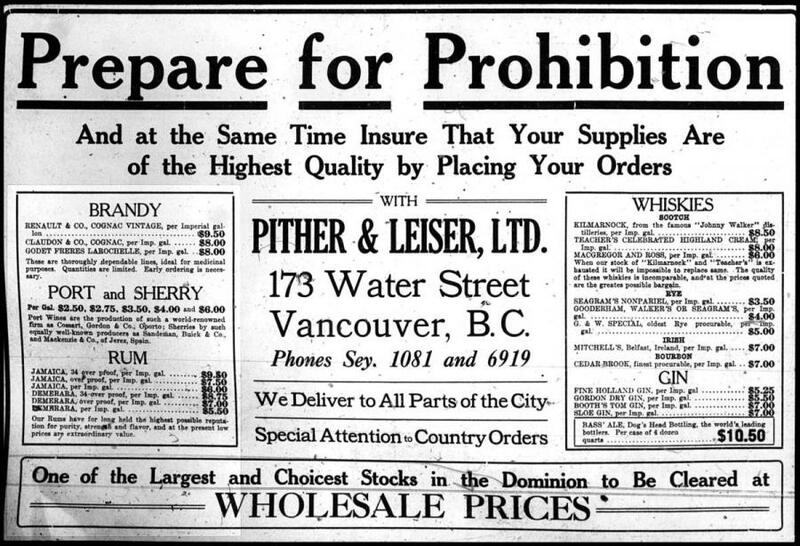 Pither and Leiser stayed in business through to 1921, despite prohibition in British Columbia from 1917 to 1921. (In Victoria it’s suggested that the company’s alcohol ‘sales’ rose significantly during the period of US prohibition). The next occupants of the building were Oscar Brown, effectively switching places with Pither and Leiser. They were followed in 1922 by Clarks’ Fruit and Produce – seen here in 1924, and still occupying the building in 1940. They had been on the block since 1918, initially next door, then two doors down. In 1950 there was a dry goods wholesalers and a clothing manufacturing company in the building. For more than 30 years, with the transformation of Gastown into a more vibrant retail street, it is the Vancouver store of Hill’s Native Art. This Water Street warehouse was commissioned by hardware merchants the McLennan and McFeely Company. It was completed in 1905, although they never occupied it as by then they had already started building larger premises on Cordova Street. The architect of both warehouses was E E Blackmore, who worked with the more experienced W T Whiteway on this building. This was an unusual arrangement as up to this point Blackmore usually worked with his father, William, who had designed many of the city’s early buildings, but William had died in 1904. McLennan & McFeely leased the Water Street building to the Canadian Fairbanks Company; at the time the largest machinery and mill supply company in Canada. They didn’t only use the building as a warehouse, they had a wonderful machine shop – there’s a beautiful picture of it in the City Archives, dating from 1905 like the picture above. 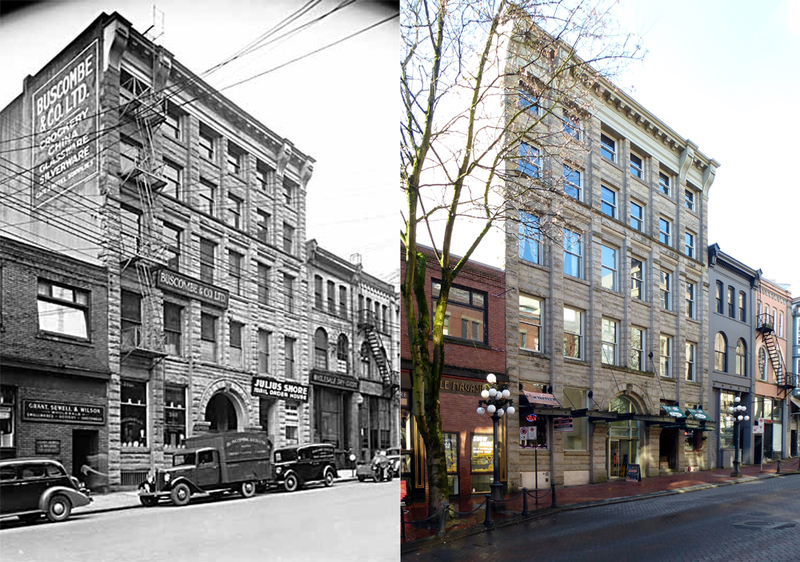 By 1930 the building was occupied by Thompson Elliott Limited, wholesale grocers, as this VPL image shows. They moved into the building in the early 1920s, replacing David Spencer Ltd who used the warehouse in conjunction with their rapidly expanding retail emporium. Like many of the buildings on the north side of Water Street, (the water side), the Canadian Fairbanks building was built on piles driven into infilled water lots. By the 1980s the foundations had decayed to the point where collapse seemed imminent. Fortunately, extensive renovations in 1987 reclaimed the building for office and retail use.